Zeiss Jena 150mm Barrel Lens Mounted on Noba Camera’s Lens Board. Note air hose and bulb for Packard shutter. 4″ Packard Shutter mounted on rear of Noba lensboard. Note air hose connection at bottom of piston. Completing our discussion of shutters requires mention of a famous shutter that, although most commonly found on large format (4×5 in and larger) cameras, nevertheless holds a firm place in photographic history: the Packard shutter. Throughout the late 19th and early to mid 20th century, many fine lenses were produced without shutters; in modern terminology, these are referred to as “barrel” lenses. They were often designed for aerial photography (e.g. the Kodak 7″ f/2.5 Aero-Ektar), as industrial process lenses, or for use on cameras with alternate shutter types. Some, such as the lovely East German f/4.5 Tessars (see above), the Cooke Anastigmats, and the Zeiss Jena Symmars and Planars, have excellent optical qualities. Many of these classic lenses are of considerable size and can be lethal if dropped from a high place. Fitting a conventional shutter to many of these behemoths is a daunting and expensive undertaking. Enter the Packard shutter. There are some inventions that are so basic, functional and foolproof that they remain essentially unchanged for decades. One is the humble mousetrap; in its familiar form – pine board, pieces of wire, and a spring – it has been decimating those little furry pests, essentially unchanged since James Henry Atkinson patented the original “Little Nipper” in 1897. The other is the Packard Shutter. The origins of this humble device are obscure. 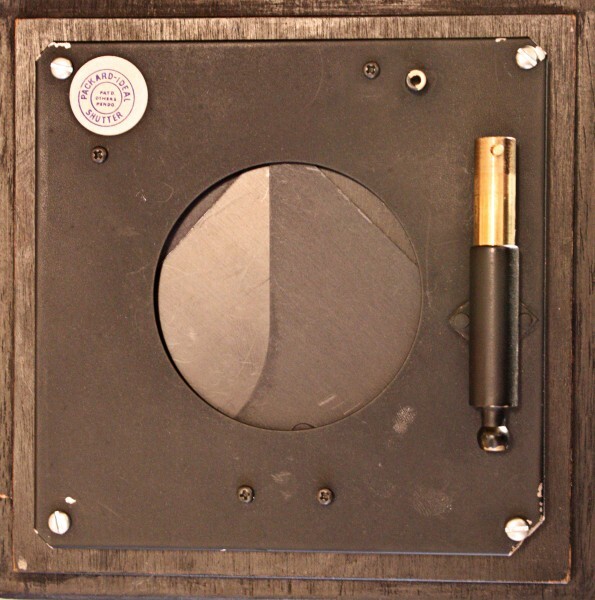 A product of Yankee ingenuity, it is variously described as dating from the Civil War or originating “…in the late 1800s…” Consisting of a thin, flat metal case with a central opening and three blades driven by a simple air-powered piston, it is still manufactured by the Packard Shutter Company of Fiddletown, California. Its virtues are twofold: it is indestructible and virtually foolproof, and is almost the only way to use many fine vintage lenses that lack shutters. The only other alternative would be to use a focal plane shutter-equipped camera such as a Speed Graphic, but the lens boards on Graphics are frequently too small to accommodate these large lenses. Though typically found on large format cameras and thus technically outside the scope of this site, the Packard’s place in photographic history is so well established that no discussion of shutters is incomplete without it. 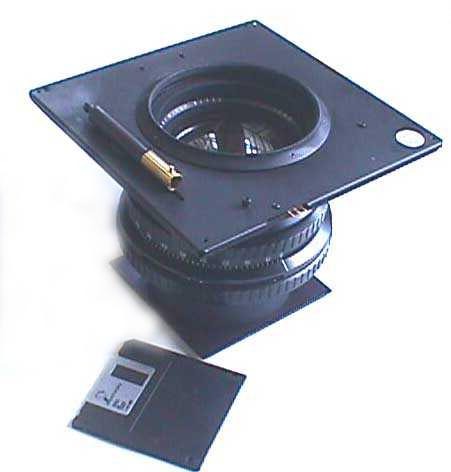 The shutter consists of a thin (1/4 inch), flat metal case with a central circular opening, containing three coupled blades of black fibrous plastic approximately 0.020 inches thick. The mechanism is activated by a simple non-lubricated, air-driven piston connected to a flexible air hose and bulb. Shutters are available with central openings ranging from 1 1/2 to 3 1/2 inches; larger sizes, which can be custom ordered, find application in astronomy and scientific work. 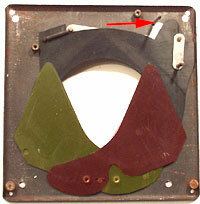 The blade mechanism consists of two leaves, separately pivoted near the bottom of the case. These overlap slightly at the center of the opening, but do not quite cover the top of the opening. 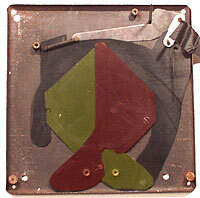 Simultaneously, a “guillotine” blade moves down to cover the remaining area. The air-activated piston moves the guillotine blade (sometimes called the “master blade”), which is coupled to one of the vertical leaves by a small rivet: this first vertical leaf is then coupled to the other vertical leaf by a second rivet. 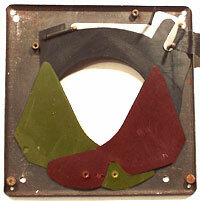 In this manner, movement of the guillotine blade opens or closes all three blades. The Packard Shutter comes in two versions: the Packard Ideal No. 5 for time exposures, and the Packard Ideal No. 6, which has an “Instantaneous” mode with a single shutter speed of 1/15-1/25 second. The No. 6 is shifted from time to “Instantaneous” by means of a small brass pin that can be pushed in to engage the instantaneous mechanism. “…This is my Packard shutter with the rear cover off. I’ve colorized two of the leaves to make it clearer. 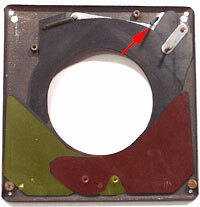 On the left image, the upper red arrow shows the inserted pin. The lower red arrow is where the air piston pushes up. This works because all the pieces are pinned together. The upper yellow arrow attaches the piece being moved by the piston to the aluminum piece underneath and the black piece in between. 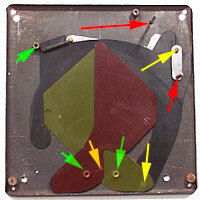 The black piece is attached to the yellow piece at the lower right yellow arrow and the yellow piece is attached to the red piece at the lower left yellow arrow. As the pieces move they pivot around pivot points which are identified by the lower green arrows. The upper green arrow as a post that acts as a constraint to the black piece to keep it from moving to the left. The second picture shows where the aluminum piece is hitting the pin as the air piston moves it up. If the pin wasn’t there it would just continue straight up to open the leaves. This is where it gets interesting. As the piston continues to move up the aluminum piece is slid right as it moves up the pin. This slides the pin that has been moving the black piece up out of the black piece. The pin inserted from the back is now in the notch of the aluminum piece and the leaves are open. As the piston continues up the aluminum piece starts to rotate around the pin and the left end of the aluminum piece is now pushing the black piece down which causes the other two pieces to close. Packard Shutter Front Mounted on Zeiss Lens. Photo courtesy of S. Grimes. Were the Packard to be used on a roll film camera, the limited range of shutter speeds would be a significant limitation. 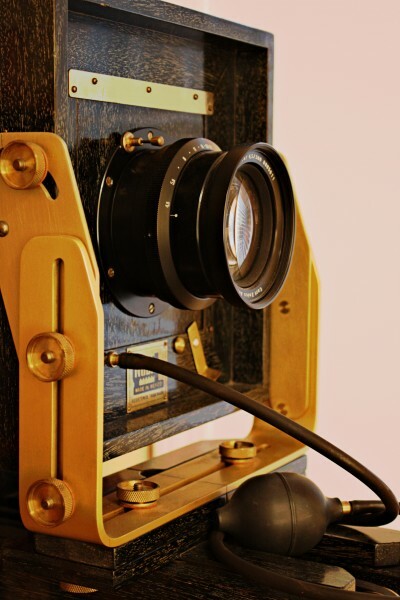 However, in large format work where images are typically taken at small apertures and exposure times are longer, being limited to 1/25 second or longer is a restriction that one can usually live with, particularly if the Packard allows the use of an unusually fine lens. Bellis, M. “History of the Mousetrap.” http://inventors.about.com/od/mstartinventions/a/mousetrap.htm. This entry was posted in Photographic History, Shutters and tagged Packard, Shutter by randcollins. Bookmark the permalink. Well, its definitely a “wide angle” type, being as its says so right on it, so I guess it will cover your format. And it doesn’t have a thread at the back, unless the whole thing unscrews from the flange. And it doesn’t look like it will easily come apart into front and rear cells. The problem with mounting it on a shutter is as I said, its got to be a big enough shutter; based on the published sizes I’d say you want something like a #4 Ilex, which has about a 2 1/4″ front cell thread. These aren’t too common. There are similar sized Deckel Compound shutters. Wollensak also made large shutters (trademarks were Alphax, Betax, etc.). There is a #4 Alphax that should also work for you, I have one on my 15″ Graflex Optar. In my experience none of these large shutters are easy to come by. The most common source I’ve seen are the Wollensak Raptar/Graflex Optar tele lenses; the 15″ (380mm) in particular, sometimes these can be found in shutter and they aren’t generally that expensive. Sometimes they do come up in ebay – here’s one in your size, looks like a #4 Alphax- http://cgi.ebay.com/U-S-NAVY-ALPHAX-SHUTTER-/200615118973?pt=LH_DefaultDomain_0&hash=item2eb597c87d And a #4 Ilex with a nice Ilex Tessar – http://cgi.ebay.com/Ilex-Paragon-Anastigmat-F-4-5-E-F-8-1-2-S-4-Shut-/320708014865?pt=Camera_Lenses&hash=item4aabaff311 Have you checked the S.K.Grimes site on the subject of the Packard shutter ? That is probably simpler and cheaper, though you won’t get much choice in speeds._________________I like Pentax DSLR’s, Exaktas, M42 bodies of all kinds, strange and cheap Japanese lenses, and am dabbling in medium format/Speed Graphic work.